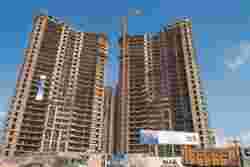 New Delhi: Second-quarter earnings at DLF Ltd, India’s top real estate developer, will decline from a year ago as improving home sales haven’t been enough to spark a pickup in profit. Developers will need to see a recovery in the commercial segment to show better numbers, analysts say. The figures, however, are better than those in the preceding quarter, signalling that demand has returned and financial restructuring has helped. DLF is expected to post a 77.11% drop in net profit to Rs442.98 crore and a 53.86% fall in revenue to Rs1,727.62 crore in the three months to September, based on a poll of five brokerages—Edelweiss Securities Ltd, Citigroup Global Markets India Pvt. Ltd, India Infoline Ltd, Motilal Oswal Financial Services Ltd and IDFC-SSKI Research. That would mark an 11.86% increase in net profit and a 4.71% increase in revenue from the preceding quarter. The drop in DLF’s earnings is mostly due to a decline in contribution from the earnings of DLF Assets Ltd (DAL) due to weak commercial prices, a report by India Infoline said. DAL, a company owned by the promoters of DLF that used to buy the realty firm’s completed assets, used to account for up to 40% of the listed realtor’s revenues until December. DLF expects to report earnings on 29 October, according to a company filing on the Bombay Stock Exchange. The recovery in the housing sector has gained momentum, analysts Siddharth Bothra and Mansi Trivedi from Motilal Oswal wrote in a recent report. Average real estate prices have increased 10-15% across metros such as New Delhi and Mumbai, the report said. Also, developers have used the funds raised through qualified institutional placements and private equity either to replace debt or fund execution of projects, the report said. Developers are executing projects at a quicker pace to improve liquidity positions. Some companies are again looking at acquiring land, which is available at attractive prices, the report said. In the commercial real estate, there are some signs of recovery, with enquiries increasing sharply and lease transactions restarting, the Motilal Oswal report said. “We expect the recovery to gain momentum in the third quarter of the fiscal," Bothra and Trivedi said. The average debt-equity ratio of key real estate companies has declined significantly from 1:1 to 0.4:1, Motilal Oswal’s analysts wrote. Unitech Ltd, the country’s second biggest real estate developer by market value, may report a 44.81% decline in net profit to Rs198.08 crore and a 36.68% decline in revenue to Rs634.02 crore from the year earlier. On a sequential basis, profit and sales may have risen by 25.54% and 17.41% respectively. The company is expected to report results on 31 October. Housing Development and Infrastructure Ltd is likely to post an average net profit of Rs194.8 crore on revenues of Rs380.2 crore in the July-September quarter—a fall of 26.67% and 24.41% respectively from a year ago, show two analyst estimates. Indiabulls Real Estate Ltd is expected to post revenue of Rs73.4 crore and net profit of Rs9.5 crore, according to estimates by Edelweiss Securities. That represents a 10% fall in revenue and 20.25% increase in net profit from a year ago. According to Citigroup, Bangalore-based firm, Puravankara Projects Ltd is expected to post revenue of Rs64.4 crore and a net profit of Rs20 crore in the second quarter, a 53.79% fall in revenue and a 60.37% drop in net profit compared with the year ago quarter, while Omaxe Ltd is expected to post a net profit of Rs23.4 crore on revenues of Rs130.8 crore, which means a 14.87% increase in net profit and a 38.72% fall in revenue compared to the same quarter the previous fiscal.